Story: Based on George Crile's book about the CIA's largest and most successful covert CIA operation, the arming of the Mujahedeen in Afghanistan. 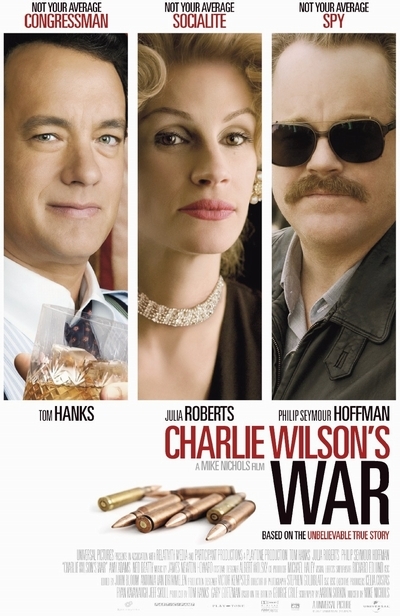 The covert ops were engineered by Charlie Wilson (Tom Hanks), a charismatic, wheeler-dealer, liberal Texas congressman who teamed with a rogue CIA operative (Philip Seymour Hoffman). The two manipulated Congress, the CIA and a host of foreign governments in order to assist the Afghan rebels in their fight against the Soviets in the 1980s. Many of the men armed by the CIA went on to become the Taliban's enforcers and Osama bin Laden's protectors.